Tyler S. Leavitt captured this image of the bright full moon in the cloudy Las Vegas sky on Jan. 1, 2018. Skywatchers got a glimpse of a spectacular full moon this New Year's Day — the largest the moon will appear in 2018. On Jan. 1, Frank Job captured this shot of the largest full moon of 2018 passing over Toronto: "Multiple image composite," he told Space.com in an email. "All images taken at 200mm f8 with varying shutter speeds to maintain moon brightness. City brightened in post." Frank Job sent Space.com this multiple-image composite of the full moon over Toronto, using varying shutter speeds to keep the moon at the same brightness and also brightening the city in post-processing. Astrophysicist Gianluca Masi, of The Virtual Telescope Project, photographed the full moon over Rome on Jan. 1, 2018. 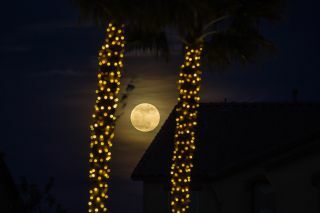 Tyler Leavitt, photographing the moon from Las Vegas, told Space.com: "It was a rare cloudy night here in Las Vegas; still a couple cool photos of the supermoon rising between the clouds and palm trees." Tyler S. Leavitt photographed the full moon in the skies of Las Vegas on Jan. 1, 2018. Alexander Krivenyshev took this photo of the Jan. 1, 2018, full moon from Hoboken, New Jersey, showing it shining over New York's Empire State Building. On Jan. 1, the moon appeared 14 percent bigger and 30 percent brighter than when the full moon is at its farthest point from Earth. The next full moon, which will occur on Jan. 31, will be at the moon's closest approach as well (although it won't be quite as close as it was on Jan. 1) — and it will present a total lunar eclipse! On that day, skywatchers will see the moon turn blood-red as it passes through the shadow cast by the Earth. Editor's note: If you captured an amazing photo of the Jan. 1 New Year's Day full moon and would like to share it with Space.com for a story or gallery, send images and comments to spacephotos@space.com.